We all know how powerful Dataweave Transform Message component is. This is such a powerful template engine that allows us to transform data to and from any format (XML, CSV, JSON, Pojos, Maps, etc. basically ). So if we need to transform we need a Dataweave component in our flow. But wait! Dataweave also provides us a function called Dataweave function that helps us to execute Dataweave language outside a Dataweave transform component. 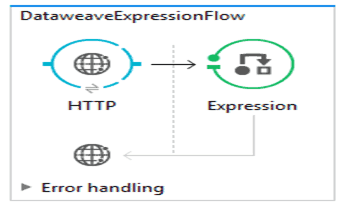 To execute a Dataweave expression outside a Dataweave transform component, we need to put the expression inside dw() function wrapped inside within an MEL expression #[ ]. In this blog, we will demonstrate the use of Dataweave expression outside a Dataweave Transform Message component by using dw() function. Let’s take a use case where we have a JSON payload that needs to be transformed into an XML or a JSON payload of our format. The JSON payload will enter in our Mule application as an input and will get transformed into a modified JSON payload/ XML payload as output. 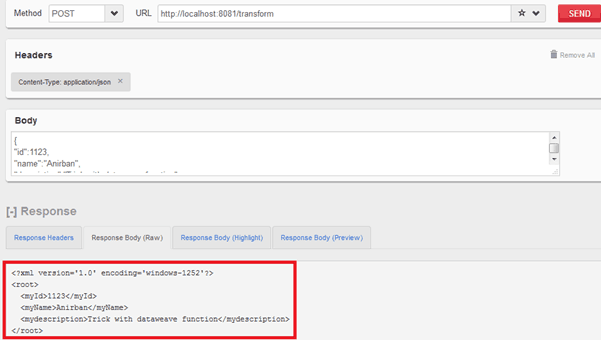 However, what about using the powerful Dataweave expression outside a Dataweave transform component? We will try to achieve this without using a Dataweave Transform Message component. 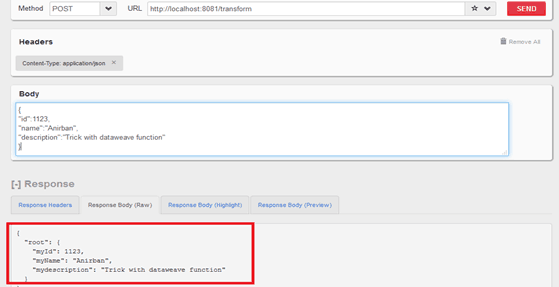 Here we will get our desired transformed JSON response as output. This is what we get above. A response in XML! As we can see the Dataweave language is such a powerful tools and can fit into an expression outside the Dataweave Transform Message component, and we just need to invoke the dw() function. The expression will return whatever the transform outputs is and in the output format defined within the parameter. The expression can be put into any transformer component like Set Payload transformer or Expression transformer component. Using a dw() function, we can quickly query data and use it to log information from payloads, route data to another flow(using lookup function), or use it for quick payload transformation. If you’re still new to Dataweave, check out our Getting started with Dataweave blog series. What is the advantage writing in Dw() function in expression fileter instead of using Data weave! Can i use this dw function in Java Component if Yes please let me know how to use that. As I have mentioned at the end of the blog that the advantage of dw() is to perform the features of Dataweave, so it can be used for quick payload transformation or to log information from payloads. It is very use full post. Thanks for the information. I have one doubt, Mule developed on Java, to transform json to xml or anything in dataweave internally which technologies they used. is it groovy ? please let me know. It’s is a lightweight expression language of dataweave called dataweave expression language.